Posh defender Ricardo Santos lifts matchwinner Martin Samuelsen up after a 3-2 win at Sheffield United. Photo: Joe Dent/theposh.com. Posh beat the in-form Blades courtesy of three stunning goals, the last one a brilliant individual effort from on-loan 18 year-old midfielder Martin Samuelsen. Samuelsen was a late substitute for Marcus Maddison. Posh midfielder Chris Forrester scoots away from Conor Sammon of Sheffield United. Photo: Joe Dent/theposh.com. Conor Washington and Erhun Oztumer also netted for Posh with shots from outside the penalty area. The win kept Posh in sixth place, but they now have a three-point lead over Southend in seventh. Westley said: “That was a huge win for us. To come to Sheffield United with such a young side to play a tough team in a very tough environment, and to win is a great credit to my players. “We endured some hard moments, but we deserved the win over the 90 minutes. We showed great character, great courage, great confidence, a great spirit and we played some quality football. “The goals we scored just emphasised the talent we have in our team and Martin’s goal was simply stupendous. From the minute Martin walked through the door myself and Grant McCann knew we were working with an immense talent. He’s a Premier League star of the future. “His goal would have graced any stage. He has great ability, but he is also a very likeable lad who is a joy to work with. “I told the players beforehand that this was the perfect fixture for them. They were playing a top team in a great stadium. They are also a team that is hard on our heels chasing a promotion place. “The confidence we will take from winning will be considerable. The joy on the players’ faces at the end told its own story. “Some of my players were in the Conference South 12 months ago so to be part of a win at Bramall Lane will do them no end of good. If we can win here we can certainly go on and achieve what we want to achieve this season. “We did come under pressure in the first-half, but we played well in the second half and we had chances at 2-1 up to extend our lead further. Westley signed one of his former Stevenage players, Lawrie Wilson, on loan from Bolton before the game. The 28 year-old made a pleasing debut as a half-time substitute. Westley also handed central defender Jack Baldwin his first start since damaging knee ligaments 14 months ago. “Jack was absoloutely outstanding,” Westley added. “Massive credit to him. We’ve nutured him back and he was composed, confident and aggressive in a controlled way. “Me and Lawrie know each other very well. He’s a fantastic athlete and a very good footballer. He did a solid job when he came on as they had caused us problems down our left. Posh are trying to extend Samuelsen’s loan from West Ham. His original one-month deal has now expired. 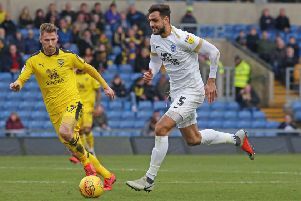 Posh are next in action in an FA Cup third round tie at home to Championship side Preston - Westley’s former club - on Saturday (January 9).